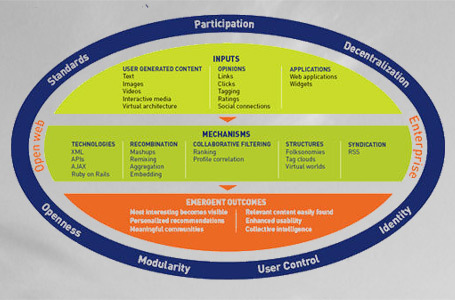 Web 2.0 is a convergence of social and business practices rather than a technology transition. In fact many of the technologies that make up Web 2.0 were available during the early 90s. Rich Internet Applications: Practices, Technologies and Frameworks. Frameworks: JQuery, RubyonRails (RoR), Dojo, Yahoo Widgets, Google Gadgets. Social Networks: Facebook, Myspace, Twitter, LinkedIn, Friendster, Ning, Jive, Socialtext, Awareness, Google, Microsoft, IBM, Social Networking standards and interfaces. Cloud Computing: Compute and storage infrastructures are available to use as utility rather than within one’s own infrastructure. Can include computer hardware, platform service and complete applications (eg Salesforce.com) as an external service. Web-centric development and architecture models: |Web 2.0 provides a different way of building applications.. Applications are hosted with a fast feature velocity (ie features added much quicker timeframe – days rather than months), use development methods such as agile and scrum, have massive scalability, use frameworks such as Mapreduce, Hadoop and BigTable and use interfaces such as JSON and REST. Data: Content Aggregation, Syndication and Federation via RSS and Atom. Analytics. Trending towards Semantic Web and Web 3.0. Mashups:Web apps are increasingly becoming mashups where content is combined, annotated and aggregated from different sources. Scale Free and Long Tail: The Applications are scale-free. Websites must cope with peaks in usage and must not crash under the occasional heavy load. The long tail is the concept that. although there are some products (eg new books, music, movies)that are popular and sell a large number of single products, there are also smaller markets that prefer many related products that are rare or less well known. Mobility: Mobile phones , Tablets and mobile phone networks have become pervasive and all powerful. A High Performance Sales team is created by combining good hiring of sales people with Leadership with a scalable sales model. High performing sales people (stars) have a unique combination of skills and knowledge. They excel at building customer relationships, developing successful strategies, managing internal resources and beating their targets every year. A sales model will take the best of these skills and experience and turn an average sales person into stars. Read more at Sales Model.